RALEIGH (WTVD) -- As Cheryl Croom Williams walks through a heavily wooded area with so much tree cover that it serves as a natural canopy from the pouring rain something catches her eye. She heads over to the bottom of a Magnolia tree and brushes away fallen leaves. "I can't make out the name," she said while squinting to read the engraving on a tombstone. Despite being the caretaker at Oberlin Cemetery for years, she has just discovered someone's final resting place. "This is the first time I've seen this one," she said. "This one's a little different because it looks like it has rocks embedded in the concrete." As she strolls the rest of the cemetery, she explains there's only a rough idea right now of how many people are buried here. 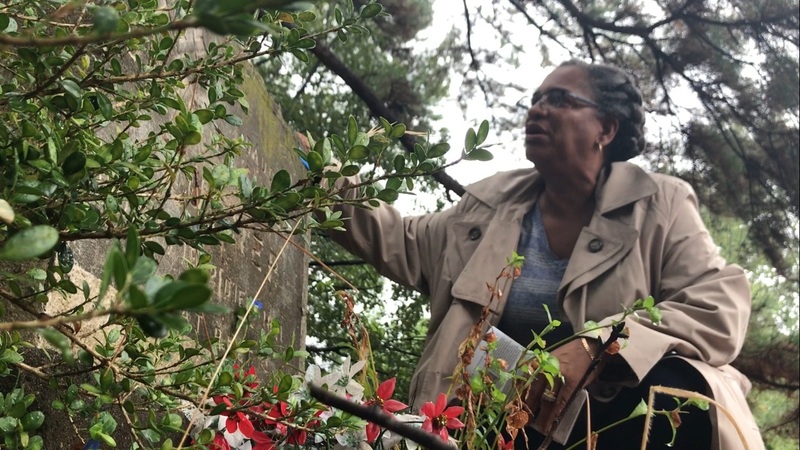 Williams, as well as other volunteers, are on a mission now to not only preserve the area and figure out how many people were interred in the near 3-acre plot of land, but also showcase the buried history hidden behind busy Wade Avenue. "Raleigh's a great city. There a lot of different pockets of history here. We want to be recognized," she said. "These people contributed to the history of Raleigh and the United States in a meaningful way." The Oberlin Cemetery was established in 1873 and was one of the few places in Raleigh where African-Americans could be buried. "It took a long time for blacks to be integrated into society," she said. "You had the Jim Crow Laws. They reinstituted the slave laws, and so you had a segregated area where black people could not shop, eat, be buried with, go to church with, go to school with the white majority." Oberlin Village was the largest freedman's Reconstruction-era black settlement in Wake County. It was founded in the late 1860s, and by 1880, roughly 160 families lived in Oberlin Village. It was named in a tribute to the Ohio college that supported the education of African-Americans. According to the North Carolina History Project, the land once belonged to plantation owner Duncan Cameron. He reportedly owned 1,900 slaves, which was more than anyone else in the state of North Carolina. "Many of the artisans that are buried here built the buildings around us (in Oberlin Village), and especially in Downtown Raleigh, where they're doing all the development now and preserving," Williams said. "A lot of those buildings were built by black hands. " Today, there are some tombstones on the property, but mostly field stones. "Coming out of slavery, coming out of Reconstruction, it was very simple," she said. "The early generations, 1800s and early 1900s, people didn't have a whole lot of money to spend." When volunteers started cleaning up the cemetery years ago, they also found sea shells buried next to some bodies, indicating the deceased descended from Africa. "They (the shells) are a symbol of journey or crossing over," explained Williams. Volunteers believe at least 645 people are buried in the lot. The nonprofit The Friends of Oberlin, which oversees the property, has partnered with North Carolina State University to do research. A team is using laser technology to figure out how many are buried. Once that work is done, volunteers want to create pathways and install benches so people can visit their ancestor and properly pay their respects. Williams has a hope for the cemetery moving forward. "That it'll be a place of honor for the people who are interred here. That it'll be a place where we can educate people not only on the archeology, the geography, the botany of that time, but also the contribution that people have made to Raleigh," she explained. The cemetery has been named a Raleigh historic landmark, and a marker sign will be unveiled October 15 along Wade Avenue to let the 15,000 drivers who travel the road each day know the cemetery is there. The hidden cemetery is only accessible through the InterAct parking lot. There are several clean-ups a year to help maintain the property, and there's even a Facebook page for the group.